Combining salvaged art and locally produced alcohol, San Luis Obispo real estate developer and property manager Mark London has created what might be the county's first green bar. Think Cheers, but with Captain Planet as the barkeep. 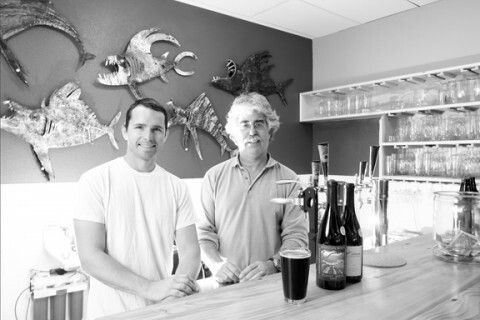 RAISING THE BAR : Mark London (right) opened SLO Down Pub in Arroyo Grande. SO-AND-SO (left) built the bar out of a fallen pine tree. The pub features locally produced alcohol, recycled fixtures, and a green heart. # In an attempt to provide locals and tourists alike with quality entertainment and a splash of conservationism, London recently opened SLO Down Pub at 1200 East Grande Ave. in Arroyo Grande. The beer and wine bar is the newest addition to the Green House Galleria, a collaborative workspace of local vendors, contractors, and artisans that offers a variety of products and services focusing on the use of recycled and sustainable materials. From the natural bamboo flooring to the lighting fixtures made from 100 percent recycled materials, and everything in between, London's healthy Earth/localism concept is on full display. Take the bar, for example: It's made from a pine tree that fell in Cambria. The beers are brewed in Nipomo. All of the wines offered are produced in SLO County. "The business philosophy is based on environmentally sound principles," London said. "And we're basing it on everything local." In addition to the homegrown drinks and indigenous construction materials, Green House Galleria offers a diverse range of art, including paintings, sculptures, ceramics, woodwork, jewelry, and steelwork--all of which are built from recycled materials by local artists. Need some entertainment as a side dish? The galleria also houses a dance pavilion, ceramic workshop, and live music. Want to participate? Bring your banjo or fiddle to the pub every third Sunday of the month and participate in a bluegrass jam session. "We want you to come in, slow down, and have a good time," London said. SLO Down Pub is open Monday through Thursday from 11 a.m. to 11 p.m. Friday and Saturday from 11 a.m. to midnight and Sunday from 1 to 8 p.m.
For more information, call 481-4015. Staff Writer Kai Beech compiled this week's Strokes and Plugs. Send your business news to strokes@newtimesslo.com.